Q: How does Lindsay Drilling differ from all the other drilling companies around? A: Lindsay Drilling is a family owned and operated business that was started in 1949 by Wes Lindsay. We believe that family should all be involved to provide the best possible service. That is why all the drilling is conducted by either Terry, Britt, or Ryan Lindsay and the paperwork is handled by the wives Linda and Carrie. We also believe that quality and service should always go hand in hand. Q: How deep is an average water well in our area? A: Most wells in our area range from 60-300 feet depending on the location. Sometimes in the higher mountains and certain areas water wells can be deeper. Terry, Britt and Ryan Lindsay are able to make a knowledgeable estimate as to the depth of a water well for your property by meeting with you and researching other wells in that specific area. Q: How does Lindsay Drilling determine where to drill a new well? 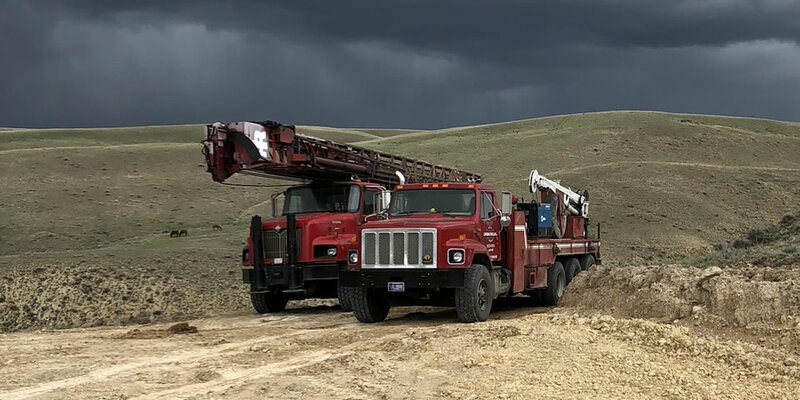 A: With more than 60 years of experience and knowledge of drilling in this area we feel confident that we can help you pick a site to drill a new well. We can look up other wells in the area and also can look at geological reports to help determine the best location. However, water is a science and we can not guarantee the site for the new well will produce adequate water, but we will do our best. Q: Can we guarantee that your well will make water when it is drilled? A: Unfortunately the answer is No- water can not be seen below the surface and we can not guarantee that a well will produce water. However, we will do the best that we possibly can to get you and your family a good working well. Q: How much water is needed to run an average household? A: A good house well should produce at least 10-15 gallons per minute. If you are planning to irrigate your lawn on top of daily functions you should have about 20-25 gallons per minute. Q: How are water wells protected from surface contaminants? A: Lindsay Drilling abides by all of Montana’s strict water well construction standards. The top twenty-five feet of our wells are composed of bentonite grout and steel casing to protect your well from contaminants. Q: How long is the warranty on a pump system installed by Lindsay Drilling? A: All of the pumps we sell come with a one year factory warranty against defects. All of the pressure tanks we sell come with a five year factory warranty. Q: How long does the construction of a water well usually take? A: On average a water well can be drilled in 1-3 days depending on the conditions of the ground, weather and water depth. Q: What kind of drilling apparatus does Lindsay Drilling use to construct water wells? A: Lindsay Drilling uses (2) IR TH60 air rotary drill rigs to provide maximum well construction effectiveness. We have four fully licensed drillers to provide the best possible service. Lindsay Drilling has 4 pump service trucks to serve all your service needs. Our newest truck has the full capabilities to pull large pumps and turbines and clean and develop wells. Our pump crews are highly trained to provide you with the most cost effective service possible.